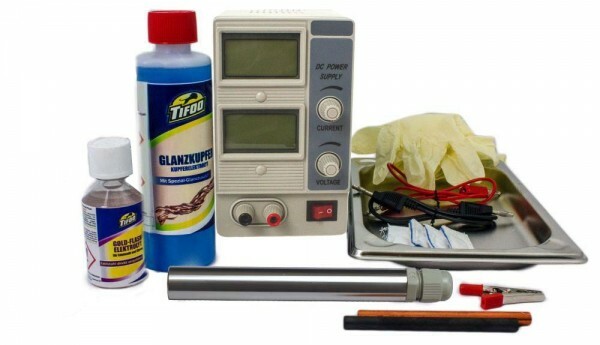 Product information "Pen plating system "GalvanoBrush" - Starter kit"
power supply with 3 amperes, 18 volts + galvanic pen "GalvanoBrush"
The Tifoo brush electroplating kit enables you to quickly start into brush plating. It contains everything needed for gold and copper brush plating. With the silver spray it is also possible to plate non-conductive materials like glass, wood or plastic. The sequence for non-conductive materials is as follows: first use the silver spray, then plate with bright copper solution and finally brush plate with the gold plating solution. With the included gold brush plating solution "Flash" you can even plate on stainless steel. If you have any questions, we'll be happily at your disposal. Related links to "Pen plating system "GalvanoBrush" - Starter kit"
Instruction manual for Tifoo Pen plating system "GalvanoBrush" - Starter kit as PDF file. Customer evaluation for "Pen plating system "GalvanoBrush" - Starter kit"